Check out the best wrinkle reducer, prepared with perfectly natural ingredients that will help you postpone the aging process and make you look young longer. Thanks to its combination of ingredients with the continued use of this remedy you will eliminate wrinkles. In addition, you will notice its benefits from the first application. Natural beauty remedies work and, in addition, have no side effects for the skin or for health. They are effective thanks to the vitamins, minerals and fatty acids they contain, with high antioxidant properties, which help us eliminate wrinkles and combat dehydration and sagging. 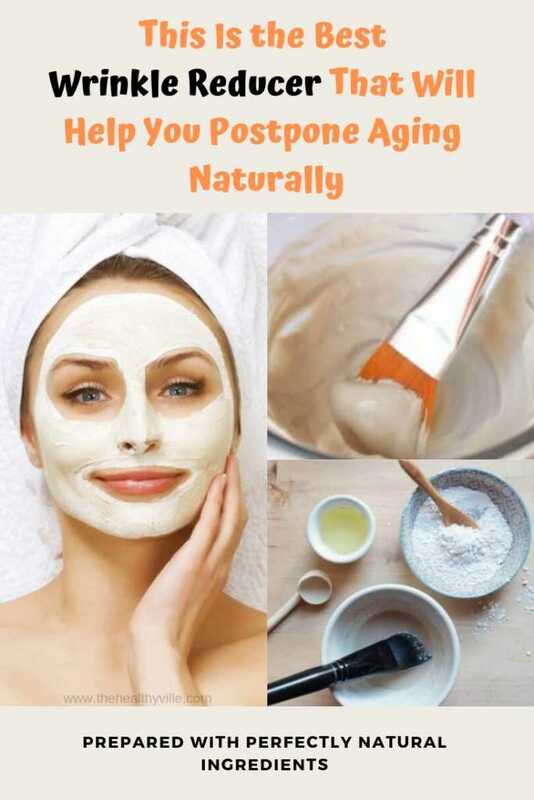 Discover in this article the best wrinkle reducer to prevent and eliminate wrinkles and postpone aging with 4 simple ingredients. To eliminate wrinkles you must learn to treat the skin with certain products, but also to take care of those factors that accelerate aging. Excessive sun exposure or in the hours of maximum radiation. The sun is beneficial for the skin and health if we take it moderately, a few minutes every day at the first or last hour of the day. Harmful habits, such as tobacco or alcohol. An unbalanced diet, poor in fruits and vegetables. Deficiency of essential fatty acids, present in healthy fats such as avocado, olive or coconut oil, nuts, seeds or egg yolk. Drinking little water, as it causes dehydration in the skin. Obviously, you better prevent something than cure it. In this sense, if you begin treating wrinkles shortly after they appear, you can eliminate them completely. If you already have them, you will be able to soften them and prevent them from being marked more. Acetylsalicylic acid is a type of medicine that helps in combating pain and fever that is marketed in the form of pills under different names depending on the country. If we use it in our exfoliants and facial masks, this acid has anti-inflammatory and cleansing properties, reduces acne, blemishes and all kinds of skin impurities. In addition, its tiny, grainy texture allows you to make a gentle exfoliation and eliminate dead cells, which favors the regeneration of the skin. Rosehip oil is one of the best vegetable ingredient to protect the skin from the effect of free radicals. It has a high antioxidant and regenerating power, excellent for dry and mature skin. You must bear in mind that this oil is not suitable for very young or oily skin. If that is your case, replace it with coconut oil or jojoba oil. Lemon juice acts as a preservative, and while it helps in removing stains, it also cleans impurities and regenerates the skin. Bee honey is an excellent ingredient in home cosmetics, thanks to its moisturizing and protective virtues. Thanks to its high content of vitamins, minerals and enzymes honey nourishes the skin in depth, while creating a layer that protects it from external aggressions. Further info: See How To Prevent Aging Skin Without Spending A Penny On Surgeries! To obtain the best results we recommend that both rosehip oil and honey are of the best quality, especially if you have sensitive skin. First, pulverize the acetylsalicylic acid tablet with the help of two spoons. Add rosehip oil and freshly squeezed lemon juice. Now add the honey and mix everything well. The honey must be well liquid to integrate the ingredients well. If it is too thick you can add a few more drops of lemon juice. How to use the best wrinkle reducer? With the face washed and damp, apply this paste on the face, especially on the areas that need it most. Massage it with your fingertips very gently, to achieve a slight exfoliation. Let this remedy act as a mask for 5 or 10 minutes. After the indicated time, wash your face to remove the product and then apply your usual moisturizing lotion. You can use this remedy once a week. However, you will start noticing its benefits from the first use. Don’t forget to SHARE the best wrinkle reducer recipe with your family members and friends on your social networks!